176 South Street—Hopkinton, MA. A new 650,000 square-foot office and laboratory building in the heart of EMC’s corporate campus with a full-service cafeteria, coffee shop, convenience store, hair salon, and fitness center featuring a junior Olympic-sized pool. Building Connector Project—Hopkinton, MA. A complex and creative design solution joining two existing buildings with a 4-level, 60,000 square foot addition. The program included an expansive 2-story lobby and reception area, security control, engineering space, conference center and employee fitness room. R & D Facility—Franklin, MA. GRLA designed a flexible 207,000 SF facility for labs, testing, light assembly and office use to accommodate 600 employees. 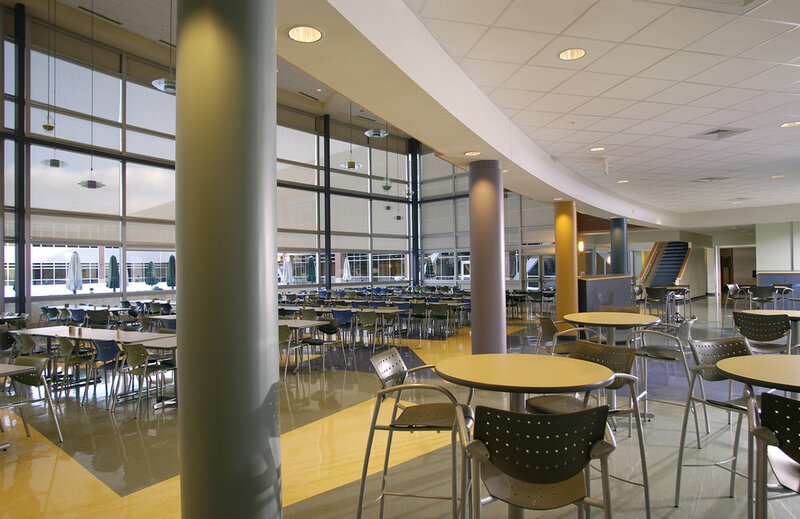 A full service cafeteria and dining area located on the top floor provide panoramic views. Building 5: Southborough, MA. GRLA recently completed an interior rehabilitation of an existing 200,000 SF building as part of a two-phase, fast-track project. Phase I included new architectural, mechanical, electrical, and plumbing systems and a new cafeteria and servery for 200 employees. Phase II of the project included the rehabilitation of 50,000 SF of space on the building’s lower level into offices and a state-of-the-art product demonstration area for prospective clients. Manufacturing Facility—Franklin, MA. Gorman Richardson Lewis completed a 700,000 SF manufacturing facility for EMC close to its R & D lab and office building in Franklin. In addition to the large assembly areas, the new building includes offices, a cafeteria, servery, and fitness rooms. Internet Solutions Group—Hopkinton, MA. This project included the complete renovation of an existing 60,000 SF building to accommodate EMC’s Internet Solution Group. The 24 x 7 facility houses two data centers as well as a core operations center, allowing EMC to maintain and monitor all technical aspects of customers’ date and commerce needs. The new building systems component includes N + 1 redundancy to prevent system interruption in the event of a power outage.